The Holy Theophany is one of the earliest feasts of the Church instituted even before the celebration of Christ’s Nativity. This is the feast of the Baptism of Christ by St. John the Baptist in the Jordan River, when a voice was heard from Heaven, “This is my beloved Son,” and the Holy Spirit was seen descending in the form of a dove. Thus, this is a Trinitarian feast of all Three Persons of the One Trinitarian Godhead, a Mystery that cannot be known by logic or reasoning, but can be entered into with faith and love. 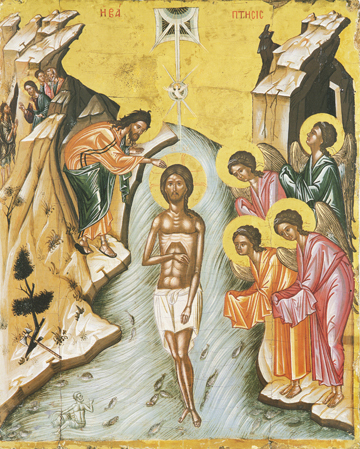 Christ is completely immersed in the waters of Jordan, the very meaning of the Greek word baptism, while St. John with a trembling hand is encouraged by Christ to do this, fulfilling all righteousness. This is not just merely an historic event that is commemorated, but as God is Infinite and Eternal, it is suffused with life and meaning that has its roots and end in Eternity. We too can enter these mysteries. The word Theophany means, “The manifestation of God.” Another term for this feast is Epiphany, which means “A showing forth of God.” This 1547 icon is a part of a set of 15 festal icons at Holy Dionysiou Monastery on Mount Athos.